Born on May 9, 1972, Dan Hollander began skating at the age of four. Born on May 9, 1972, Dan Hollander began skating at the age of four. Hollander’s first main coaches were David and Rita Lowery, with whom he trained until 16 at the Detroit Skating Club. David and Rita eventually moved to Florida and Hollander began to train under Diana Ronayne. They worked together for nine years until Hollander returned to the Detroit Skating Club to train under Mitch Moyer. Hollander qualified for his first Junior US National Championship in 1990 where he finished eighth. Hollander worked hard and later earned a bronze medal at both the 1996 and 1997 US Nationals. 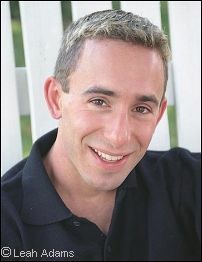 Since then, has been performing in various skating shows including Tom Collin’s Champions on Ice Tour, Art on Ice in Zurich and Switzerland, The United Way in Boston, The Jimmy Fund at Harvard, and many others. Currently, while not traveling, Dan resides in Michigan and has produced a learn to skate video “Flipping over Skating.” He has recently opened up his new business, Dan Hollander Productions Inc., which assists with skating shows, designs, costumes, choreography, and anything else skating-related. Anonymous: I saw you at Champions on Ice in Madison. The show was so great and really was the best day of my life! You were hilarious! Have you always been that goofy, even as a kid? Dan: I was a very shy kid, and my coach Rita Lowrey made up a routine where I skated with a life sized doll. I was around 14, and it opened me up to do comedy. Cheri: How do you see the world of professional ice skating changing? What do you see for its future? Dan: Well, a lot more people will probably turn pro this year. As for competitions, I don’t see very much, but I bet there will be more shows with different skaters offered. As to the rise or fall of the popularity of the sport, have no idea. Anonymous: What was it exactly that caused you to lose momentum after winning a US bronze medal? You had so much talent. Was it the publicity, coaching issues, finances? You still have talent by the way! Dan: Well, thanks for the support. This is an easy question to answer to close friends, but as of right now, I’m unable to say anything. Just know that my family is the greatest and supported me through everything. Marcus J.: Do you think figure skating has become a jumping contest? I recently watched several previous Olympic skate programs from years past and I feel the skaters do not skate with the beauty as they did in the past! Dan: I semi agree on this. I believe that Plushenko and Yagudin have been able to find a better balance with rounding out the programs so they are not just jumps. Belle: Your programs are *so* entertaining — so much fun! You’re truly a great highlight of the shows. How much of the year do you tour vs. coach? Dan: This year it will be about 5 months of touring, and the rest at home. I teach a bit, but not very much, because I’m always working on new routines. Virginia: A year or so ago I met you at the Fox Valley Ice Arena in Geneva, Illinois. You signed my boot. I told you how much I loved your program where you dress up as a woman. Your response “I’m going to do that program just for you tomorrow night.” Applause! Applause! And thanks much. I tell everyone how nice you are! Kimberly: You have certainly become popular with audiences for your outrageously funny programs. What got you interested in show skating and creating programs like this? Dan: Same story… 5 years old, saw Scott Hamilton in chicken outfit at Champions on Ice, and comedy is then what I wanted to do. Kimberly: My favorite program of yours is “South Park/Mrs. Doubtfire” – I’m looking forward to seeing it at Champions on Ice again this year. Which one of your programs is your favorite one to perform? Dan: I would say that one and Tapping With Bob. Jim Hodges: Your Mrs. Doubtfire routine is probably the funniest routine of all times and in my opinion should be in the figure skating hall of fame. I know you have three other great routines also. How do you come up with these wonderful ideas for comedy programs? Dan: Hmmm… I have no clue, but I’m sure it has to do with watching a lot of TV. Brigitte L.: You live in the Detroit area when not on tour. Do you ever hire anyone to edit your music or any of the skaters with whom you work or coach? If you do, look me up. I did Mission Impossible 2 for Elvis. Dan: Yes, I use a good buddy of mine, Scott Sumner. My Tappin with Bob piece is something he created. I made up the program with Simone Grigorescu to counts of 6 and 8, then actually wrote out the noises it would sound like, gave it to Scott, and he then created the music from scratch on his computer! And in ’98 he remade a piece from the Three Musketeers… I wanted the music to crescendo and stuff, so he computer generated the entire piece to do that, by using the keyboard to play all the instruments of the whole piece… pretty awesome eh? JoseQ: I think you are a fantastic performer. Do you ever see figure skating becoming more of a jumping contest than who has the complete package? Dan: No, for a while it has been, but like I said, it is getting way better. Briell: Where do you think pro skating is headed? Dan: Less jumping, more entertaining. Larry: You seem to have found your niche in comedy, but in the recent SOI TV special I thought that you did some pretty fine skating under that skirt — big jumps, fast spins, etc. Do you have any routines in the works that are more serious and lyrical? Dan: I have my “Angel” routine which is funny, but a bit more skating then comedy. You have to do what you are good at and hired to do. People sometimes ask why I don’t do a slow piece, and its because I don’t get paid to do it. It is hard, you do get type casted, but its ok, cause this is what I love to do. Kay: There has been lots of speculation on how the new airline security affects traveling with skates. How has it affected you all on the COI tour? Dan: Not at all, we have mostly busses and charter flights. And if we have a commercial flight, our skates go with the tour trucks and finds it way into the venues before we do. Dan: Sometimes I have NO CLUE. But, it is a tight outfit with light weight stuffing, so it moves with me. The hardest thing was getting use the feeling of the skirt and nothing on my legs! Paula: When did you first realize that skating was more than just a hobby or past-time? Dan: I was 13 years old and quit skating for a while. I was freaked because everyone kept talking about going to the Olympics, and it sunk in that it wasn’t a hobby anymore. When I started to shake and go through skating withdrawal, I knew I had to get back to skating. Paula: Can you share with us any new material that you are working on? Dan: You’ll have to wait and see!!! Paula: Do you feel that men’s skating in general has changed over the past ten years and if so, in what way? Dan: It has become a lot more technical for sure… quads everywhere you look. It is a good to see skaters try to combine this harder technical with the choreography and overall balance of a program that judges want to see. Paula: Which of your eligible competition performances would you count as your personal best, and why? Dan: ’96 Nationals for sure, because I was in the ZONE, and everything just felt so right. Paula: What area(s) do you feel your skating need improvement in? Dan: Consistency in jumps for sure. I was trained a while ago with a recipe for success; consistent drilling comes confidence and consistency. But what happens when you are injured, or don’t have access to as much ice to drill so much? The top skaters like Todd Eldredge and Elvis don’t have this recipe. They are confident regardless and can pull off jumps when they have to, even with a rough injury or no practice. I struggle to obtain that, and will achieve one day for sure! Paula: What do you feel are your strengths in skating? Paula: Are there any skaters (past or present) that have had an impact on your skating? Dan: Scott Hamilton, I model my show career after his skating showmanship. Paula: What skaters do you admire presently and why? Dan: There are so many that I do. I admire Boitano for always putting out a solid performance every night, no matter what. Scott Hamilton because he stills performs and makes people laugh. Those are the main 2. Paula: What do you like to do in your spare time? Paula: What music or favorite artists do you enjoy listening to when off the ice? Dan: Any hard rock and classic rock for sure! I’m a fan of all music. Paula: Who are your favorite authors and/or books? Dan: Raymond Feist, Asimov, and David Eddings. All sci fi and fantasy, I read that a lot. Paula: What movies or TV shows do you enjoy? Dan: Tron, Misery, and Batman 2000. Paula: Are there any particular coaches and/or choreographers that you’d like the opportunity to work with in the future? Dan: I have worked with Ben Agosto on foot work and stuff. The kid is AMAZING and if I wish I could have 1/10th of his smoothness. Paula: Where would you like to be (in regards to skating) 10-15 years from now?